This is data constructed from social network questions from the 1994 and 2000 Survey data. 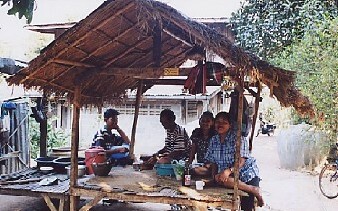 The 1994 and 2000 Surveys undertook a difficult, but very innovative, task to identify both social and kinship networks among the residents, households and villages of Nang Rong. These networks include individual, household, and village ties to other individuals, households, villages, districts and provinces. These ties are measured directly through kinship, labor exchanges, and agricultural equipment exchanges. Other ties are measured indirectly through the shared use of resources such as temples in the village, water sources, primary and secondary schools, or spatial patterning of agricultural plots.